The Head First PMP, 3rd Ed (for PMBOK Guide, 5th Ed) has just been released, barely 5 months after the PMP exam change! Well, better late than never. Sarcasm aside, I’m a great fan of the Head First (HF) series from O’Reilly and have read several titles in the series over the years. For those who are not familiar, the HF series uses a unique method to make even the most boring and dull content, lively and interesting. The HF PMP applies the same method to put the text-oriented project management concepts from the PMBOK Guide into a visually rich and engaging study guide. The book provides complete coverage of the PMBOK® Guide, 5th Edition as well as the professional responsibility area. Each chapter includes tons of games and exercises to keep you engaged, and concludes with about 20 sample questions. Overall, the book offers about 300 chapter-end questions and another 200-question full-length exam at the end. NOTE: The 200-question full-length exam is also available online for free. It would have been nice if the exam in the book was different to the one available online. The third edition of the book is not a complete rewrite, but an update to the second edition. The updates are mostly in line with the changes to the PMBOK® Guide, 5th Edition. The sample questions and the full-length exam have also been updated accordingly. Apart from the content update, the third edition include more full colored graphics and crisper print. Overall about 30% of the book has changed. HF PMP is often compared with Rita Mulcahy’s PMP Exam Prep, which is regarded as the gold standard for PMP exam prep guides. So which book is better? I would say that it’s a matter of personal preference. If you can afford, I would recommend buying both the books as they complement each other very well. HF PMP is definitely the best book to help break the initial barrier/resistance. RMC’s guide is surely more daunting. But the quality of sample questions is better in RMC’s guide. So my recommendation is to start your preparation with HF PMP and eventually graduate to RMC’s PMP Exam Prep. For a detailed head-to-head comparison, refer to the link below. Is there a Head First CAPM? Though there’s no CAPM version of HF, HF PMP is an excellent book for CAPM certification too. So, all those CAPM aspirants out there might want to consider this book too. Overall, HF PMP is an excellent resource for PMP as well as CAPM exam preparation. Do not let the format of this book fool you into dismissing it as a gimmick or a non-serious attempt at project management education. At about USD 40, HF PMP is about half the price of RMC’s guide, and a great value for money. I received a free digital version of this book from the publisher for review. I was ‘not’ paid for the review, nor was I under any obligation to recommend the book. I’m not otherwise affiliated with the author or the publisher of the book. Thank you for the insight into the materials of headfirst. As mentioned it is based on PMBOK 5th Edition. Just inquiring, are the materials of PMstudy and Simplilearn any good? I am accumulating information on the major providers and any useful inputs would be really welcome. I have only reviewed the free sample exams provided by these companies, but not their full course content. But I hope other readers can comment and share their opinion. I do have a detailed review of the PM Prepcast, which is probably the best program out there, on this blog. I haven't used the Simplilearn materials. However, I have used the Rita Mulcahy's guide and Pmstudy prep course. They both are very useful. Pmstudy has even some useful videos in their online course . Nonetheless you should be waiting to hear from a few others before you zero in. Thank you for your inputs. It's great to see help coming in so quickly. I encourage others to pitch in and share their honest opinions too. With so many products in this space, it's really tough to pick a good one. I also suggest to look for the following before making a final decision. Try out the free simulated test offered by PMstudy. Money Back policy also looks promising as per the students feedback in Pmstudy. Thank you, Christine, for sharing your views. Great book. Passed the PMP exam yesterday! Head First was my main source but I also used Rita's book. Both are very similar. I'd say Head First is more straight to the point, and easier to understand, whereas Rita's has more detailed and, in some cases, unnecessary information. I've often recommended this book both to my clients and to my students as a great way to quickly get conversant with Project Management concepts and techniques. Even if they're not going to sit for the PMP (though they should!) this is a *very* useful book. The 2nd edition aligns with PMBOK Guide 4 and should not be used anymore. You got to have the 3rd edition of HF, which aligns with PMBOK Guide 5. There are significant changes between the two editions of the PMBOK Guide. I am working on my PMI certification and I have found many of the books to be dry and boring. 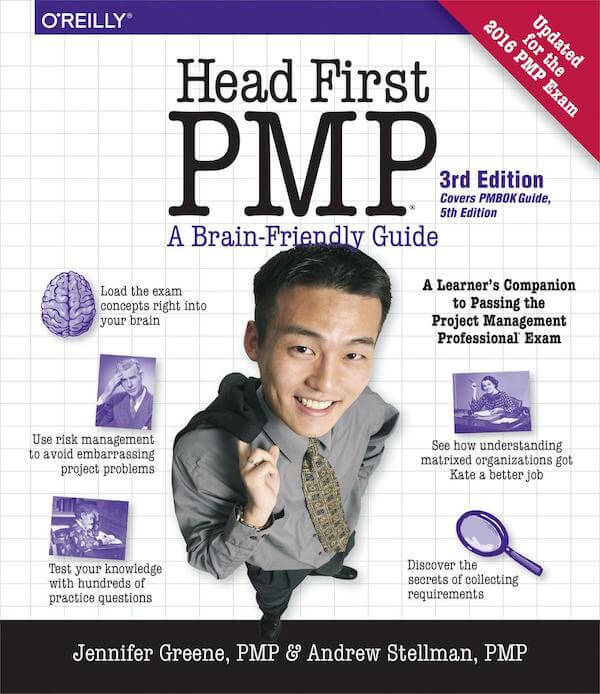 I have several of the Head First Java books and purchased this PMP book as soon as it came out. It doesn't disappoint. The format of the content makes it easy to comprehend. I highly recommend it. Thanks for sharing your feedback. I have been a fan of the Head First series too since 2005 or so.